The course is designed to help you understand how to clear Interviews, a vital aspect of a selection procedure. It enables you to have an overall view of the process, through various scenarios presented within the course. Learn to tackle common interview questions and understand what are the do’s and don’ts when attending an interview. This course strengthens your foundation on how to crack an interview in just 5 exciting levels. The aim is to understand the concept of interviews and its difference from a day to day conversation. The importance and need of interviews as a tool to measure potential candidates is emphasized to address to the careless attitude of candidates. The 3 step process of an interview is explained. The first step is discussed and tips are given about the factors that need to be kept in mind before appearing for an interview. 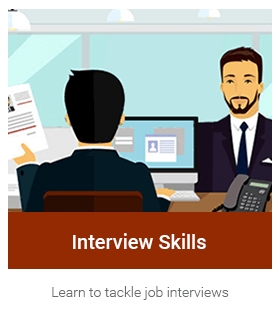 Learn and understand the direct skills and environmental factors involved in an interview. Motifs/pictures and few practice exercises will help you with your learning. As a step towards preparation of an interview, you are taught how to write a resume. Familiarize yourself with the importance of a resume as a means of impression formation on the interviewer. Format of resume writing is explained to help one create professional resumes. The remaining two steps in the interview process are explained in this level. You will be given several points to remember during the course of the interview. For example, a friendly handshake and eye contact. The need for follow up after an interview is also explained as the end of the interview process. Exercises and fun facts help you boost your learning. This level helps you understand the various types of common questions asked during an interview and the correct way to answer them. Techniques of giving structured answers to questions are also discussed. A demo interview is shown to help you understand interviews in real time.